On a lazy and chilly Friday night, hubby and I decided we should have a burger. We were around the CBD area in Sydney that evening and the Burger Project seemed a good option. I had been there before and liked, so why not confirming the expectations? There are many different burgers, and guess what, any of them you can have without the bun! Yep, they wrap it on a lettuce leaf for you. Perfect for those avoiding wheat/gluten or following a low carb diet. 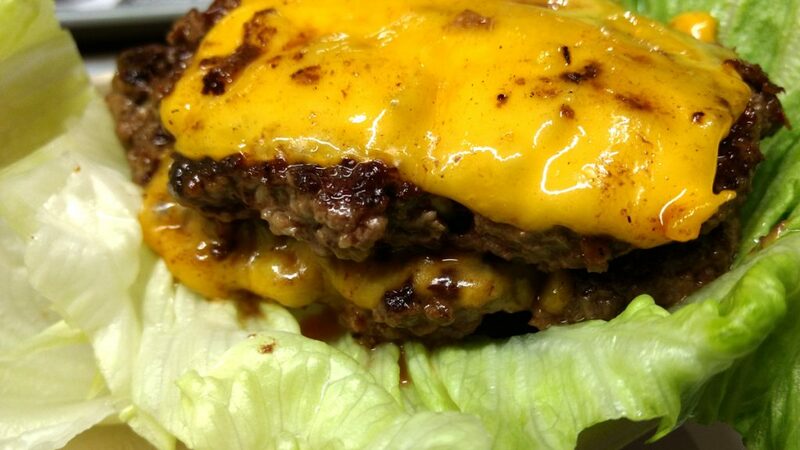 Mine: double burger – 2x grass fed beef, cheese, onion, pickles, tomato, lettuce & secret sauce. Hubby: the same, but with the bun (no photos because he ate too fast 😜). Double: 2x grass fed beef, cheese, onion, pickles, tomato, lettuce & secret sauce. About the secret sauce, it is indeed very secret. Couldn’t find any information on their website, and their employees had no idea what was in it. So if you are very strict with your diet (especially with sugar) I would recommend skipping it, just to err on the side of the caution a bit, you know.